Take a ride into the past at The Shore Line Trolley Museum and have your children visit with Santa! 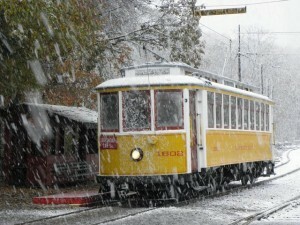 Inspect our antique trolleys decorated for the holidays. Enjoy a complimentary cookie and hot chocolate. Check out our model train layout. Bring the whole family and the camera! All children receive a small gift from Santa. You don’t want to miss getting a picture of your little ones with Santa. In the evening the museum transforms itself into a wonderland of festive holiday lights. Many of the trolleys, buildings and sites in the yard area have been decorated for the holidays adding a wonderful soft glow reminding you of Christmas’ past. Start a new tradition your family will never forget! NO RESERVATIONS NEEDED, trolleys run continuously every 20-30 minutes throughout the day, beginning at 11am.